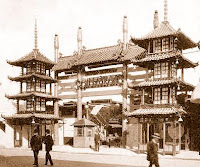 The Panama-California Exposition's amusement area was located at the east side of the grounds, parallel to the Alameda, and was known as "The Isthmus". Lining the broad 2,500 foot-long street were more than fifty rides, attractions, and concessions. On either side of the main entrance to "The Isthmus" were situated two prominent structures: the Alhambra Cafeteria and the "War of the Worlds". 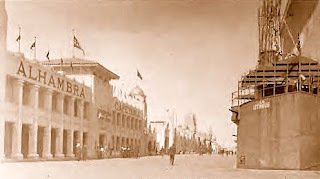 The Alhambra Cafeteria was the largest restaurant on the exposition grounds, and served as an informal dining choice for visitors, compared to the more formal Cristobal Café located nearby. The "War of the Worlds", entered through a mock battleship, was a futuristic fantasy attraction simulating a war in the year 2000, in which New York City was destroyed by sophisticated weapons, wielded by Asians and Africans arriving in scores of battleships and airplanes. Situated on both sides of "The Isthmus", heading north from the Alhambra Cafeteria and the "War of the Worlds", were scores of other interesting attractions, such as: Neptune's Wonderland (a deep-sea aquarium), Palais du Danse (a dance hall), Temple of Mirth (a fun-house), L.A. Thompson's "Anfalula Land" (a 6,000 foot-long racing coaster with a sound apparatus), Forty-Nine Camp (a California pioneer mining camp), Captive Balloon (a tethered hot-air passenger balloon), Oriental Joy Garden (a Japanese-themed retail concession), Gem Mine (a simulated underground mining attraction), California and The Missions (illustrating California's chain of twenty-one Spanish Missions), Panama Film Company (showing how motion-pictures were produced), Chinatown (simulating the old Chinese quarter in San Francisco), Hawaii - Old and New (featuring grass-skirted hula-dancers), Cawston Ostrich Farm (containing live ostriches), Toadstool (a circular-motion ride), Panama Canal Extravaganza (demonstrating a 250-foot long working model of the Panama Canal), and the Santa Fe Railroad's "Painted Desert" (a spacious enclosure containing pueblos, tepees, and simulated cliff-dwellings, occupied by Indians from the Apache, Navajo, Supai, Tewa, and Tiwa tribes). Scattered among the numerous attractions were ice cream, popcorn, peanut, candy, cider, and soda stands; in addition to restaurants featuring Chinese, German, Spanish, and American food. 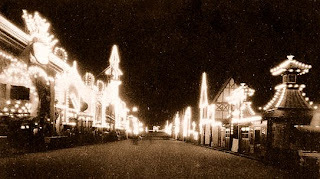 By night, the many fanciful structures located along "The Isthmus" were outlined with a myriad of incandescent bulbs, giving a festive glow to the humanity-thronged street.